Earlier this month we did a preview of Tweetie 2.1, the latest version of the popular iPhone Twitter client. Today, it has just hit the App Store as a free download for Tweetie 2 owners. While the .1 increment may make it seem like this update isn’t that big of a deal, the latest version actually packs a number of big updates. Previously, we went over the way Tweetie 2.1 integrates new-style Retweets and Geotagging, but another big addition that developer Loren Brichter was able to squeeze in is new Twitter List support. While it’s perhaps not as obvious as it should be (it’s in the “more” tab at the bottom of the app), Lists are not only viewable in Tweetie 2.1, but you can edit/create them as well. Another nice addition is the ability to report spam right from the app. Since Twitter recently created an API for this, a lot of apps are starting to integrate it in. But one of the coolest new features may be “gap detection.” Basically, Tweetie remembers the last time you updated your tweet stream and it now makes it very obvious where the new tweets start when you open the app after it being closed for a bit. Previously, these old and new tweets sort of blended together, so you had to pay attention to time stamps. You can also not click in this new gap area to load older tweets and bridge the gap between the old ones you’ve seen and the new ones. 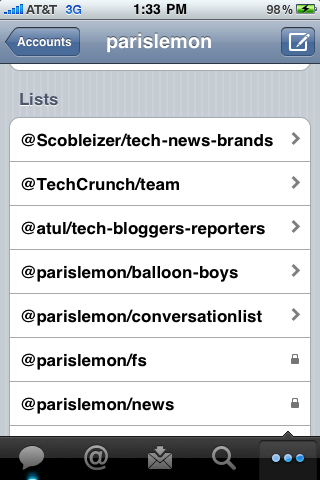 Tweetie’s handling of geolocation functionality has also been improved since we did the preview. Now that the service has been turned on by Twitter, you can tag each tweet with your location and if you decide to do that, Tweetie will remember your preference for doing that. Another Twitter iPhone app, Birdfeed, still handles case-by-case geolocation a bit better, but if you’re going to want to geotag every tweet and not worry about it, Tweetie is solid. Find Tweetie 2.1 here in the App Store. Again, it’s a free upgrade — a point which caused some controversy when Tweetie 2 came out since it required Tweetie 1 users to purchase it separately.